"Watanya Cicilla," or "Little Sure Shot," as the great Indian chief, Sitting Bull, euphoniously called Miss Annie Oakley on adopting her into the Sioux tribe, in now exhibiting her extraordinary shooting powers in Col. Cody's "Wild West" show. I had good fortune to obtain a chat with this famous "shot" in her tent, which, with the ever ready taste of woman, has been prettily decorated, and with a lounging-chair and a few improvised seats makes by no means uncomfortable diurnal quarters. Constant exposure to "rain and shine," and the trying effect of a recent illness, tend to give Miss Annie Oakley an older appearance than her girlish figure and her bright and merry manner denote. Annie Oakley was always a child of the open air in her native Ohio. She could ride as soon as she could walk; at ten she kept the larder stocked with game of her own killing; at fourteen she had paid off a mortgage on her mother's homestead with the proceeds of game and skins shot and trapped by her alone; and at sixteen she began to travel and to show to the world the skill which has proved that she has, time after time, beaten all records and yet she possesses so much innate modesty as to decline to be styled "champion." Talking over with Miss Oakley the respective difficulties of her various feats, you learn that shooting at live pigeons, especially when there are five traps "pulled" at the same time, is one of the severest tests of aim, as each bird may show a marked difference in mode and speed of flight. Shooting at single pigeons she has twice killed 49 out of 50; at clay pigeons her best record is 96 out of 100, and at double clay pigeons she broke 50 straight away, a feat which has never been eclipsed. With glass balls thrown from three traps at fifteen yards rise she broke 4,772 out of 5,000; in the second thousand she only missed 16, making the best 1,000 ball record. Miss Oakley is now showing a variety of feats with gun and rifle at West Kensington, the most difficult of which is perhaps when she throws two eggs into the air behind her, then picks up her gun, turns around, and breaks them both. Another extraordinary feat is to hit four eggs thrown into the air, as, the guns being only double-barrelled, a change is necessary while the eggs are still in the air. Miss Oakley has occasionally brought down six, actually making two changes of guns in this brief space of time; and as Miss Oakley chats pleasantly on you are surprised to learn that the firing from the head with the barrel downwards is quite as easy to her as looking along the sights from the shoulder. 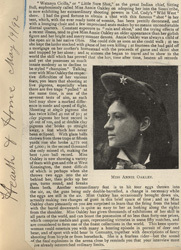 Miss Oakley has given thousands of exhibitions of her skill in all parts of the world, and can boast the possession of no less than forty-one prizes, which comprise medals and guns, representing victories in some fifty matches, and are considered to form one of the finest collections in the world. This keen sportswoman could entertain you with many a hunting episode in pursuit of deer and bear, and of sport with wild boar in Germany, together with descriptions of fancy shooting from bicycle or from horseback. She is a fearless rider—but the sound of the final explosions in the arena close by reminds you that your interview must have already outstretched ordinary limits. 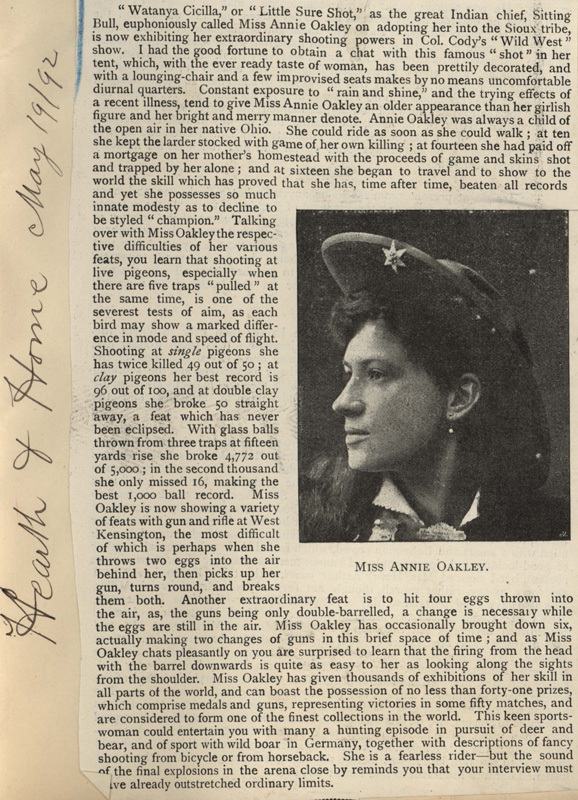 [photograph] MISS ANNIE OAKLEY.